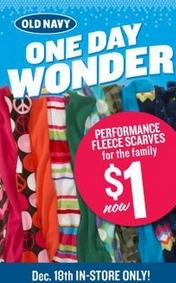 Head over to Old Navy this Saturday for the One Day Wonder and get $1.00 Fleece Scarves for the whole family. These would make great stocking stuffers. While supplies last. Limit 5 per customer.